Detroit-native Kenneth Thomas comes to Atlanta, 23 July, so we wanted to show our Southern hospitality with a #MusicMonday featuring KT's latest "Sound on Fire" mix. 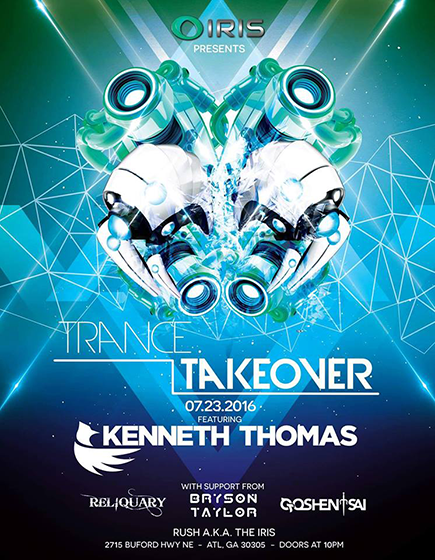 "Kenneth Thomas is without doubt one of the most promising young DJs in the electronic scene right now. There's an intelligence and a well-defined style to his sets. He's quickly emerging as one to watch in the next generation of superstar DJs." KT has released over 75 original tracks and remixes for labels including Perfecto, Coldharbour (the label founded and owned by Markus Schulz), Enhanced, Hope, Armada (the label founded by Armin van Buuren), Om, Cuurve, Alter Ego, Pacha and more. Some of KT's early hit singles include top 10 Beatport hits "Ghost in the Machine", "The Orange Room" and Coldharbour hits "Tonic" & "Achems Razorâ." Kenneth Thomas comes to The Iris (aka The Rush Lounge), 23 July 2016. Tickets are available by clicking here.